​​Get rewarded for your local and international spend. Earn a host of benefits like free airline tickets, shopping mall vouchers and up to 25% discount on select dining outlets across the UAE and much more! Get more with your ADIB Rewards program. Points earned can be used towards airline tickets and shopping mall vouchers. Earn 1 reward point for 1 AED you spend on your card domestically, and earn 2 reward points on every 1 AED spent internationally. The best and the most flexible rewards program in the market gives you the freedom to redeem your ADIB Rewards Points against flight tickets on Any Airline, Any Destination, Anytime. Purchase your ticket using your ADIB Value card. Call us on 600 543216 to redeem your reward points for shopping mall vouchers. ***Terms and conditions of ADIB Covered Card apply. Customers are eligible for a refund up to USD 5,000 per item if purchases are accidentally broken, stolen, or damaged, within 365 days from date of purchase. Manufacturer or retailer’s warranty will be automatically extended on a range of goods for a combined total of 24 months. Optional Takaful cover provided to protect in the event of involuntary unemployment, death, permanent disability, critical illness and accidental medical expenses. 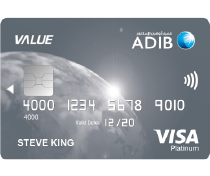 ​ADIB Online Banking – visit adib.ae to view and transact on your ADIB Value Card. 24×7 Phone banking: Call us at any time on 04-4286000 for a quick and secure way of accessing your account. e-statements: Be environmentally friendly and receive your statements via email. We understand that sometimes you need a cash boost quickly, so with Cash on Call you get access to cash up to your available limit in one easy phone call. Cash on Call helps you save on extra charges and also gives flexibility for repayments with variable tenure options. Use Balance Transfer facility on your ADIB card with a simple phone call. ** The Balance Transfer and Cash on Call Terms and Conditions apply.